Is an Upcoming Pakistani Airline Getting New Embraer E170LR Aircrafts? An upcoming Pakistani airline is seeking to lease three Embraer E170LR aircrafts. According to a post by Muhammad Afsar Malik on LinkedIn, an “upcoming” Pakistani airline is seeking to operate 3 leased Embraer E170LR aircrafts. 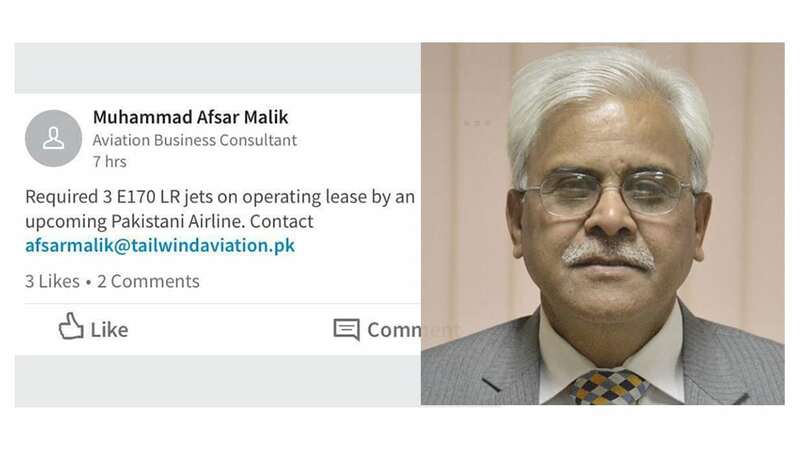 Muhammad Afsar Malik, an aviation business consultant and runs TailWind Aviation, posted on his LinkedIn “Required 3 E170 LR jets on operating lease by an upcoming Pakistani Airline.” Additionally, he mentioned his email address to attract the potential investors. Afsar Malik, according to his website and LinkedIn account, has a comprehensive background in the aviation sector and has served for many years with the Civil Aviation Authority in Pakistan. Joined Civil Aviation Authority (CAA) in 1987 as an Air Traffic Controller, after 14 years of service in Pakistan Air Force and Pakistan Navy as an Aviator. According to our sources, Afsar has been a respected and upstanding officer of the CAA. He served as Airport Manager Jinnah International Airport Karachi as well as Benazir Bhutto International Airport Islamabad. The Embraer E170 is a popular aircraft, operating with various airlines like JetBlue, Air Canada, KLM, Helvetic, and Lufthansa. The E170 uses the General Electric CF34-8E engines. The E170 seats 66 passengers in a two-class layout and up to 78 in a single class layout with a 30-inch seat pitch. The aircraft has a range of 3,800kms. These specifications make the aircraft suitable for both domestic and short international routes with a small seating capacity. However, the airline company that’s seeking to operate the E170 is not known yet. Tailwind Aviation has also not commented on this affair as yet. Rumors suggest that at least 5 more airlines plan to enter the domestic market in the coming months. Why Not AirBus A380 ? first read out the specs and flying aviation skills of both, not only the prices discriminate but other features too. Breaking news: united motors introducing 250000 PKR car. A380 has a caoacity of 853 pessengers while this has only 66. Ki kha bethay o? Mentioned aircraft is 1st generation modified engine which is sort of obsoleted in my view. Much more better if our government think towards 2nd gen or further more which has less maintenance cost and better weight handling capability.